Most days at SAM, this bamboo Basket in the shape of a boat draws attention only for its remarkable artistry and creativity. The maker shows an ability to see the life inside the bamboo, and then to channel it toward the creation of a symbol—the boat—and a form—the basket. The medium seems to effortlessly transform: In places it’s gnarled like wood, or frayed like raffia, or braided like rope, always contributing to the total picture of boat-ness. 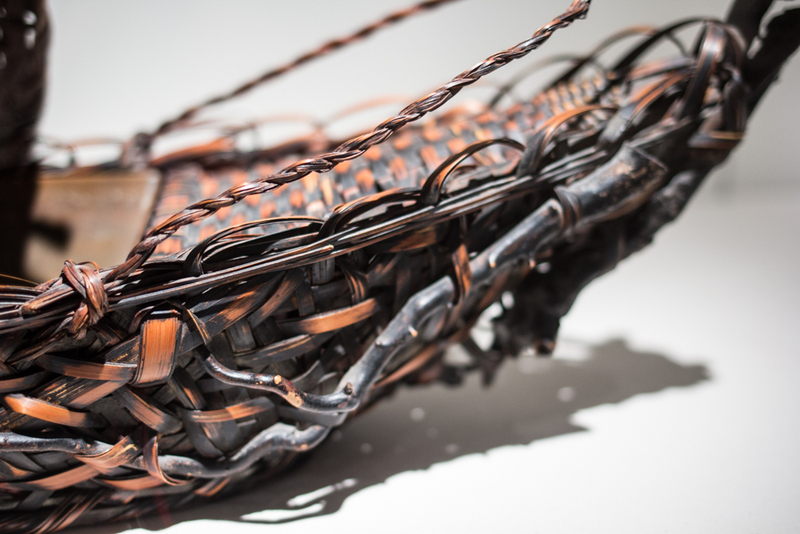 The piece was produced in Japan during a 20th century revival of interest in traditional Japanese craft, when bamboo baskets gained an elevated importance in the country’s artistic production. As fine an artistic example as it is, this week, it takes on another meaning as a reminder of a dark period in U.S. and world history. World War II brought about all kinds of terrible things, including racial conflict. Executive Order 9066, signed by President Roosevelt on February 14, 1942, authorized military authorities to exclude “any and all persons” from designated areas of the country as necessary for national defense. In practice, the government targeted only Japanese resident aliens and Japanese Americans. The U.S. government uprooted more than 120,000 Americans of Japanese ancestry from homes and placed them under armed guard for up to four years. Sixty-five percent of these people were American citizens (these statistics according to the Smithsonian Institute). A local connection to that dark time exists, too: Exclusion Order Number 1, issued on March 24, 1942, dictated that all Japanese resident aliens and Americans of Japanese ancestry on Bainbridge Island be removed under military guard. Herded into one of 10 camps in geographic isolation, these and other Japanese Americans endured the war in terrible conditions until the mass imprisonment came to an end in December of 1944. The formal ceremony that communicated Japan’s surrender took place on September 2, 1945, aboard the USS Missouri in Tokyo Bay. There was a lot of healing to be done, to say the very least, and in the years following the war, SAM played its role in bringing about a rapprochement between the Japanese American community and the many other people groups that make up our nation. For Lee’s and SAM’s part, engaging with Fujikawa at least demonstrates a lack of the xenophobic fear that inspired war-time decisions like the internment camps. In the summer of 1951, SAM hosted its first post-war exhibition of Japanese art. From May 9 through June 3 of that year, visitors to the Volunteer Park museum could enjoy Paintings by Japanese Children, a show organized by the Japan-American Society of the Younger Generation in Japan. Two years later, an exhibition that was quite a bit more ambitious came to Seattle. 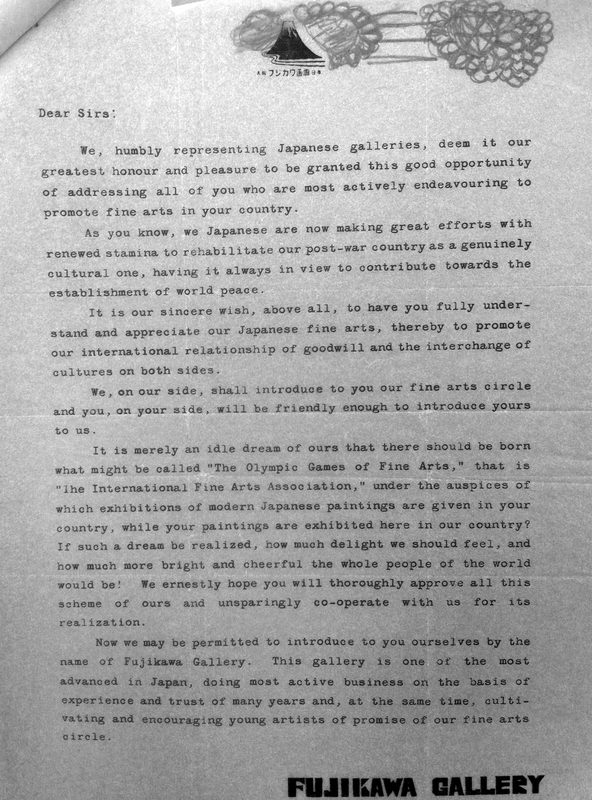 The Official Japanese Exhibition of Painting and Sculpture, on view July 9 through August 9, 1953, marked a very important moment for the museum, as it became the site of a highly publicized international exhibition. In its 20 years, SAM had previously hosted one such international show—on the art of India, in 1944—but the 1953 Japanese exhibition became its most important display yet. The museum was open seven days a week for the running of the show, bringing in paid attendance of over 57,000 and a total attendance of more than 73,000. In order “to help defray the heavy expense of this exceptional exhibition,” director Dr. Richard Fuller imposed a stiff charge of an additional 50 cents for entry. 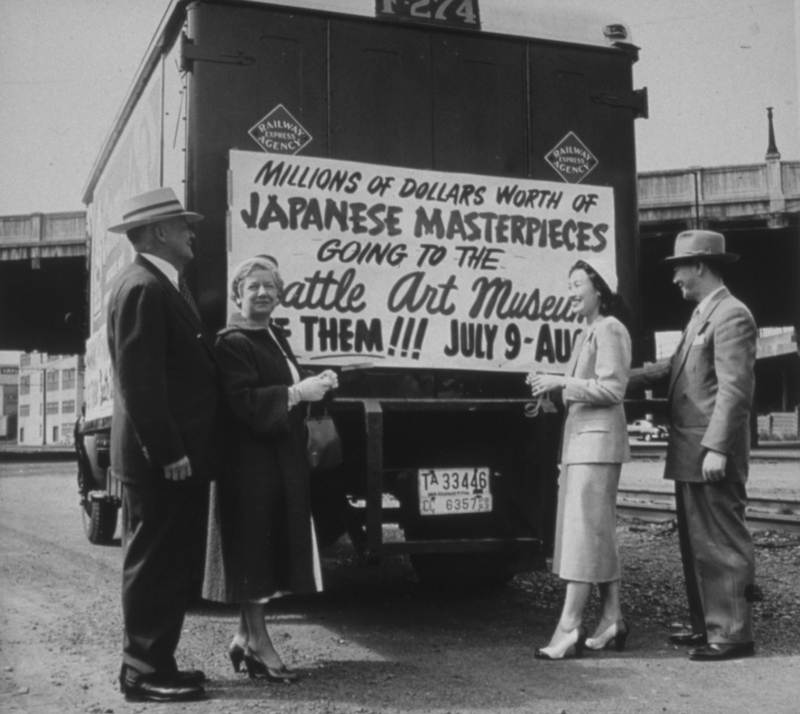 Below, you can see Dr. Fuller with his wife Betti (they were married in 1951) and visiting dignitaries, accompanying a truck full of the Japanese artworks and, in a darn questionable move, drawing all kinds of attention to their cumulative value. More important than its effect of raising the museum’s visibility on the local and international stages, the 1953 exhibition communicated a sense of solidarity. At a time when racist thinking toward Japanese Americans definitely lingered, the show offered a peace branch, encouraging people from diverse backgrounds to engage and enjoy Japan’s fascinating art culture. From my perspective, that remains the hope for SAM today: to be a meeting place for people where, through thoughtfully and artfully made objects, we can learn to appreciate each other better. 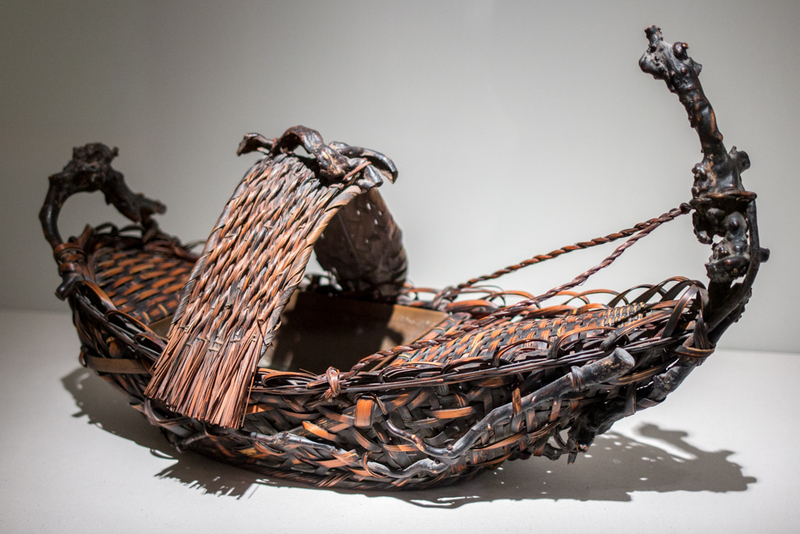 Images: Basket in the shape of a boat, 20th century, Japanese, bamboo, 13 3/4 x 23 1/2 x 12 1/2 in. Seattle Art Museum, Gift of Esther Rose Fallick. Basket in the shape of a boat (detail). 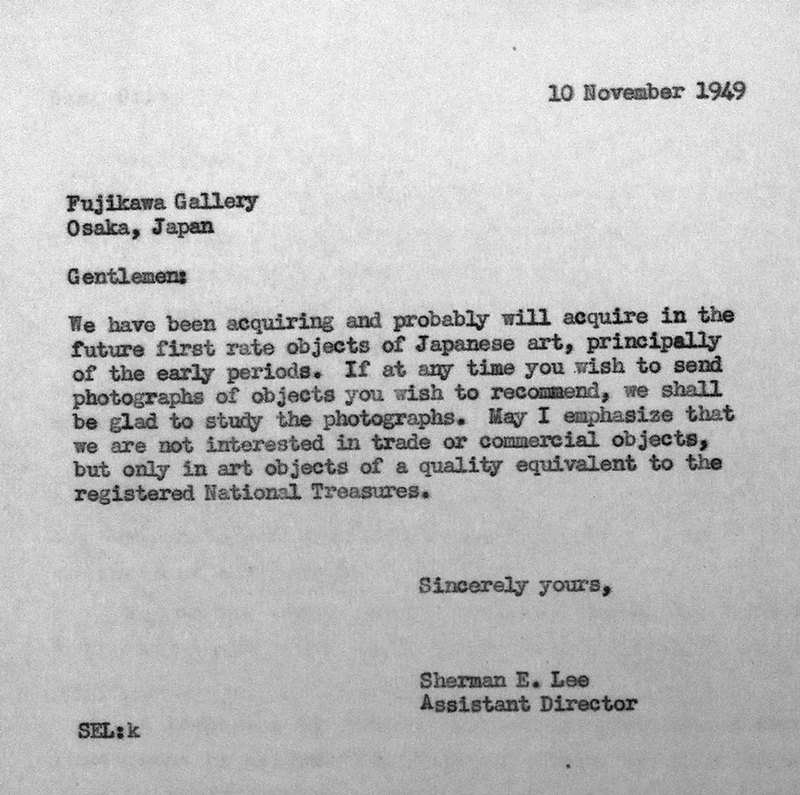 Letter from Sherman Lee to Fujikawa. 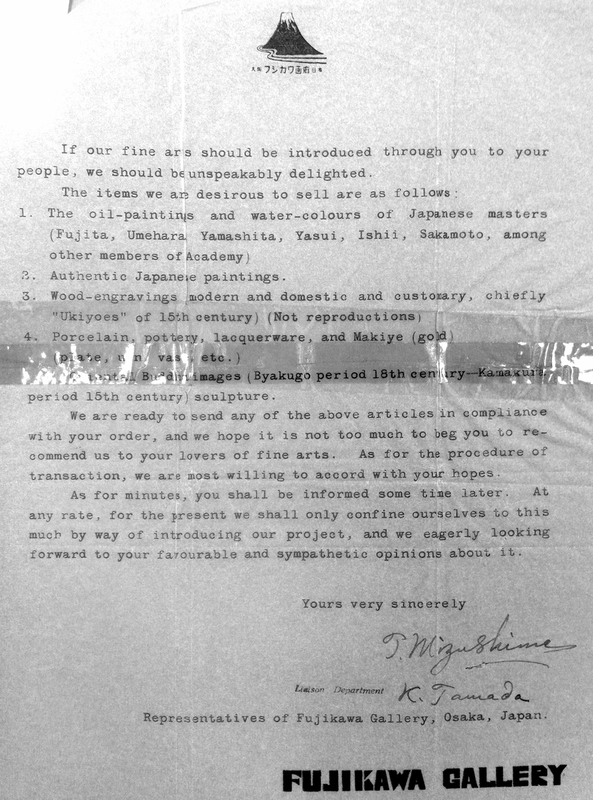 Response from Fujikawa to Sherman Lee. 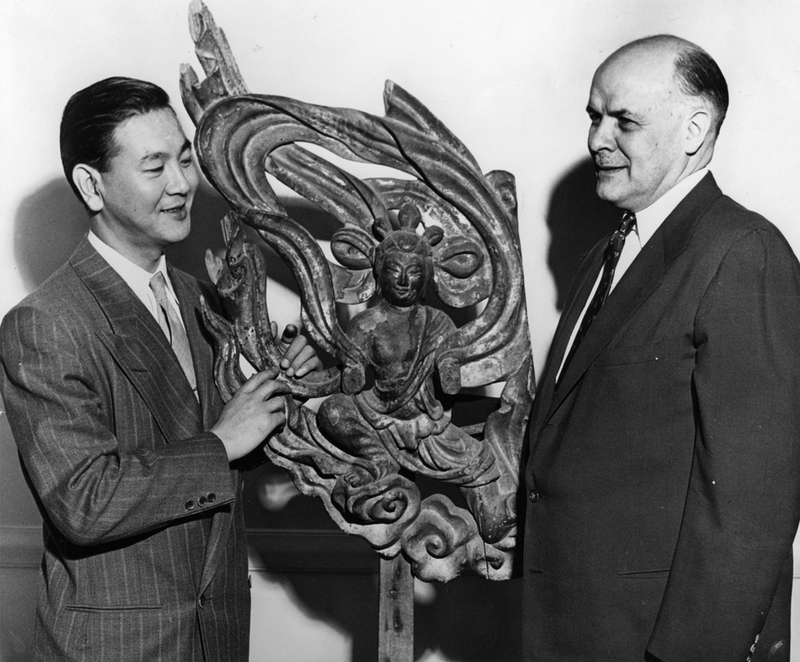 Dr. Fuller with Consul Saito of Japan at the opening of the 1953 exhibition. Japanese exhibition mobile ad.